Sunday night's episode featured the Top 7 artists each performing two songs live nationwide for American Idol judges Katy Perry, Lionel Richie and Luke Bryan as well as home viewer votes -- a song either written or recorded by Prince as well as a hit tune from the year the Idol contestant was born. American Idol host Ryan Seacrest announced at the conclusion of the broadcast Jurnee and Catie had been ousted from the competition based on the results of the real-time, home-viewer voting that occurred as the finalists performed. With a half-hour left of the show, Ryan revealed about 16 million votes had poured in and the race was "very tight." 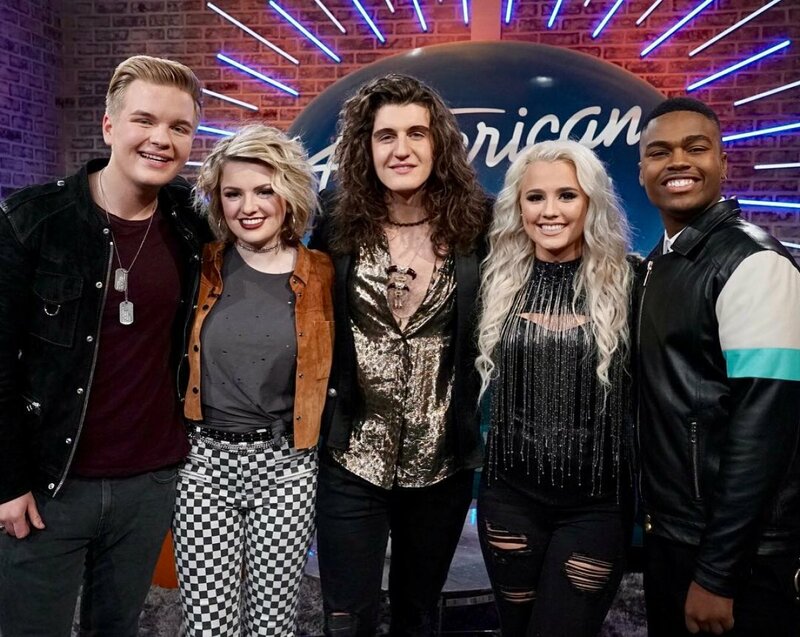 The season's Top 5 contestants are Maddie Poppe, Michael J. Woodard, Gabby Barrett, Caleb Lee Hutchinson, and Cade Foehner, and one of these hopefuls will be crowned American Idol's winner later this month. This week, the Top 7 contestants were guided and mentored by Nick Jonas. For the first time on a reality singing show, Prince's entire catalog of songs was opened for the contestants to choose from and sing. Jurnee performed "Kiss," and Lionel said she "took care of business." Katy added that she looked "like a snack." Michael sang "I Would Die 4 U" and received a standing ovation from the judges, who agreed he owned that rendition of the song but could work even more on letting loose and being confident in himself and his talent. "The sky is the limit my friend," Lionel noted. Maddie Poppe impressed with "Nothing Compares 2 U." Lionel complimented her versatility, and Luke called her performance "mesmerizing." Katy admitted Maddie "may be the winner" of American Idol, but even if Maddie doesn't win the title, Katy assured the contestant, "I'm buying tickets to your show." Cade performed "Jungle Love" and earned himself a standing ovation from the judges. Luke called it a "perfect" performance and noted that Cade is "a star." Lionel said he made the song his own with "instant identity" and Katy actually had to fan her face and body in order to cool down. "I don't know what's coming over me. I could be your babysitter," Katy gushed. Catie sang "Manic Monday," but she unfortunately forgot the words to most of the first lyric. However, the judges comforted Catie and promised things like that happen all the time for even the most seasoned singers and musicians. Catie pouted that it wasn't her night, but Katy insisted, "It is your night" and she's "destined" for something great. Caleb wowed the judges with an interesting rendition of "When Doves Cry" by Prince, and he earned himself a standing ovation. Katy was so proud of him and said his guitar is his "weapon." Luke believes that Caleb can do anything he sets his mind and heart to. And Gabby performed "How Come U Don't Call Me Anymore," which was "a mic-drop moment," according to Luke. After the judges stood up on their feet for Gabby and Katy could be seen mouthing, "Wow," the judge told the artist the following: "I think you're the most ready to go on tour... you're the most comfortable and the stage is yours for the taking." As for songs from the years the contestants were born, Gabby sang "I Hope You Dance" by Lee Ann Womack from 2000. "There's only one Gabby," Katy said, before Luke admitted, "It was one of the best vocals we've heard in this room thus far. You just really did something amazing for yourself in this competition." Lionel added there was "nothing" wrong with Gabby's performance and she was "fantastic." Cade belted out the 1996 hit "Who Will Save Your Soul" by Jewel. Katy suggested he needs more dynamics in his vocal performances rather than going "full throttle" the whole time. The judges agreed it was a great performance but he struggled a bit with the lower notes. Catie sang the 2000 hit "Oops!... I Did It Again" by Britney Spears. Catie was complimented on her presentation, style and personality. The judges believe she is so unique and said she needs to start believing she is a star. Katy also gushed about how Catie sounded like Amy Winehouse singing the pop song. Caleb sang the 1999 song "Amazed" by Lonestar. Luke told him to roll with this "newfound confidence," but Lionel acknowledged the screaming girls in the audience may have thrown him off a bit. Michael wowed with the 1997 hit "My Heart Will Go On" by Celine Dion. He received a standing ovation, and Katy revealed Michael has the potential to go on and have a career like Jennifer Hudson, who has won an Oscar and Grammy. Katy was so impressed by Michael's musical tastes and presentation. Luke added that when Michael sings, people feel forced and compelled to watch his every move and listen to his every word. Jurnee sang "Back At One" by Brian McKnight from 1999. Katy thought it was "really cool," but it wasn't her favorite rendition of the song because she didn't feel "chill bumps" while Jurnee was singing. Lionel commended her on being completely calm during that difficult song. Channeling the year 1997, Maddie performed "If It Makes You Happy" by Sheryl Crow. Lionel gushed about how Maddie has a future in this business, no matter what happens on American Idol. Katy loves watching the artist play instruments, calling her "a true artist." The Top 5 will be flown to Nashville, TN, this week to be mentored by former American Idol winner Carrie Underwood. During the next show on May 13, the contestants will sing from Carrie's songbook. Ryan also announced Sunday night the Top 7 American Idol contestants will be joined by former winner Kris Allen and go on tour this summer across the country.